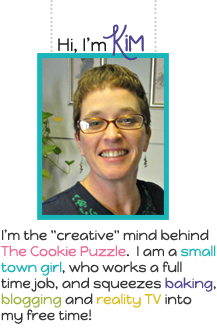 You are in for a very special treat today at The Cookie Puzzle! Today..I have a VERY special person guest posting here! Wanna know who it is? It is Melissa of Simply Sweets by Honeybee! These cookies, in March of last year. her cookies and blog posts. I met her...well, not met met her...like online met her! And...she is just the sweetest person. She is so talented..and caring. In just a few short months...she has become my PERSON! If not, I suggest you get one. Have you noticed that my pictures have gotten better? That is because of Melissa! More frequent blog posts...yep Melissa! but get your own...this one is mine.! One thing I love about Kim is that she loves things simple. 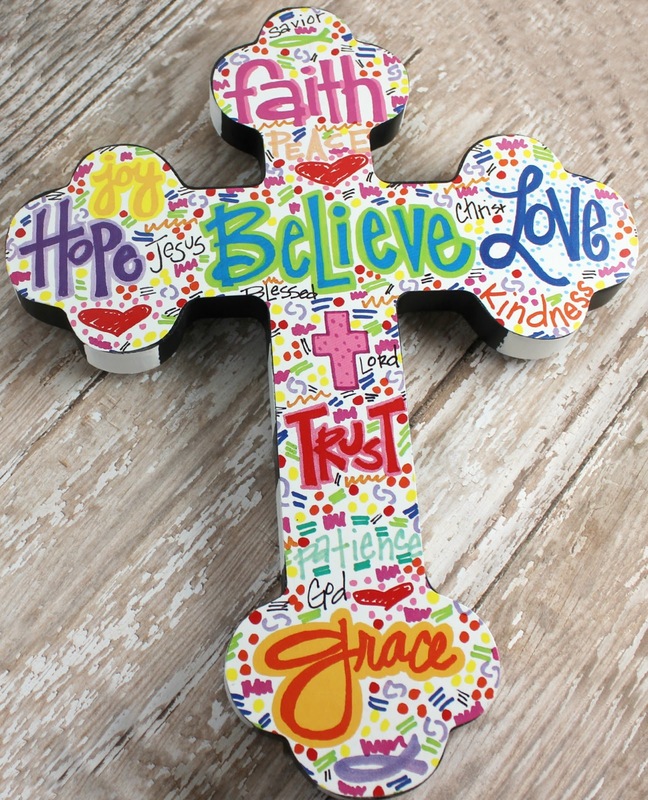 So in honor of her motto simple is better, I'm showing you how to make these inspirational message crosses. 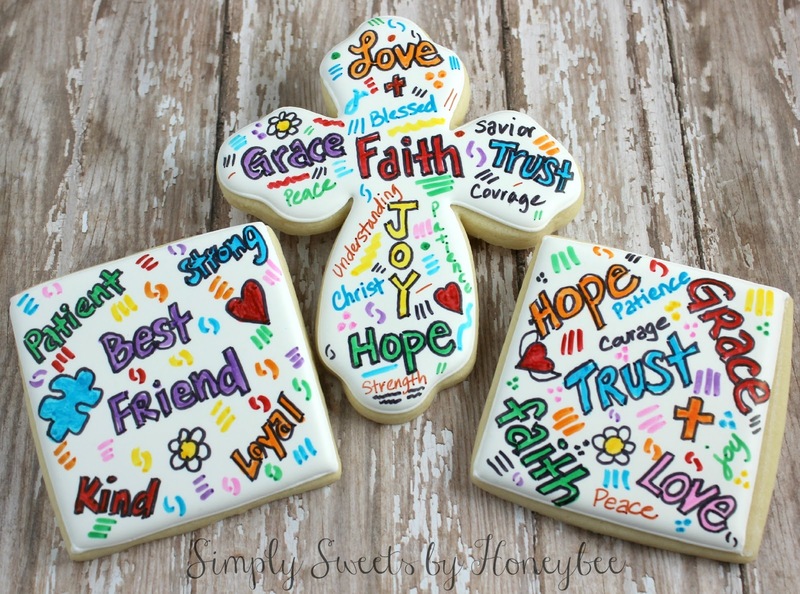 They are made using a base coat of royal icing and food color writers. That's it. You don't have to have amazing decorating skills. All you need is your imagination to turn cookies like this into whatever you want them to be. 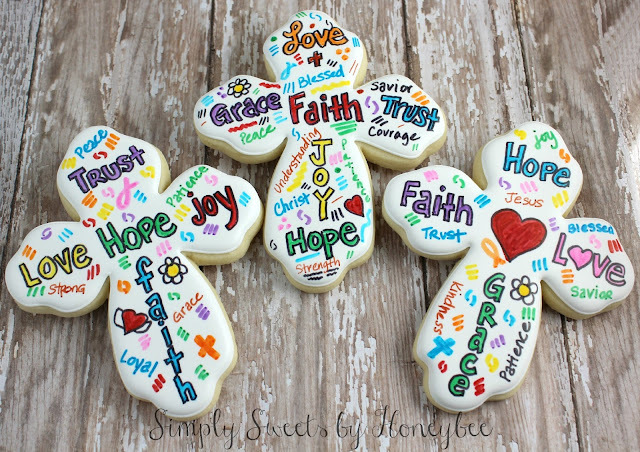 They don't have to be perfect because you are basically doodling on the cookie and they don't have to be religious at all. I made some square cookies too and one was made especially for my bestie Kim. 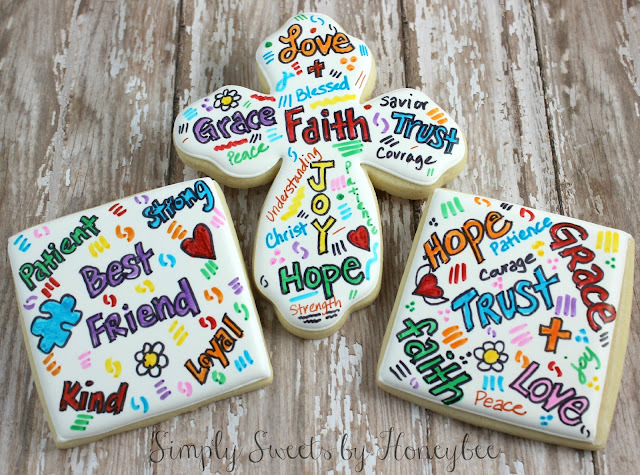 This technique would be great for Valentine's Day, with words of love on them, or for any other holiday or special event. If you don't follow my blog then you might know that I frequent Hobby Lobby a lot. I find a lot of my inspiration there and these inspirational crosses were no exception. All it took was me seeing this cross in the store and it instantly became a cookie in my mind. I collect crosses and this gem came home with me. I put together a video tutorial for you to see how simple a cookie like this is to make. I hope you will give this technique a try. I have plenty of other tutorials on my blog and would love for you to come on over and visit. Thanks for letting me take over your blog today Kim. It was fun. Hugs! Thank you so much Melissa! Once again your cookies blow me away! So, what do you think, should I have more guest bloggers on my blog? Let me know what you think...I love to here some feedback. If it is something that you enjoy, I might invite other guest bloggers. Thanks Cristin! My penmanship used to be a whole lot nicer but years of typing and now cookieing has ruined it. Thank you Cristin! Aren't Melissa's cookies always amazing? Of course there is third person...her name is Cristin....don't you remember..YOU were the one who introduced us? I hope you will join me soon, if I have more guest bloggers...us glaze gals have to stick together! Was there a fourth, I don't want to be George, lol! Awww...thank you Tami...I think you are pretty neato too...I hope you will join me in the future and be a guest blogger...I think your cookies are great...just like you! Thank you Beth.....I think Melissa always does great cookies..but these have to be some of my favorites! So gorgeous!! Love that you love each other so very much! Girlfriends are the best! They are gorgous aren't they Lizy? Yep...girlfriends are the best...Melissa is a true blessing in my life! These are awesome!! You did a fantastic job, Melissa! I think I have a cookie tutorial crush on you. I always feel so relaxed when I watch your videos. The music is always relaxing and you make it look so easy! Kim- I don't visit your blog enough! love it!! These are awesome! I love the colors and you definitely captured the original inspiration piece. Great job Melissa, thanks Kim, for featuring her! These cookies are AWESOME! I love the colors on the white. You did an amazing job! The cookies are awesome! What a great piece to draw inspiration from!